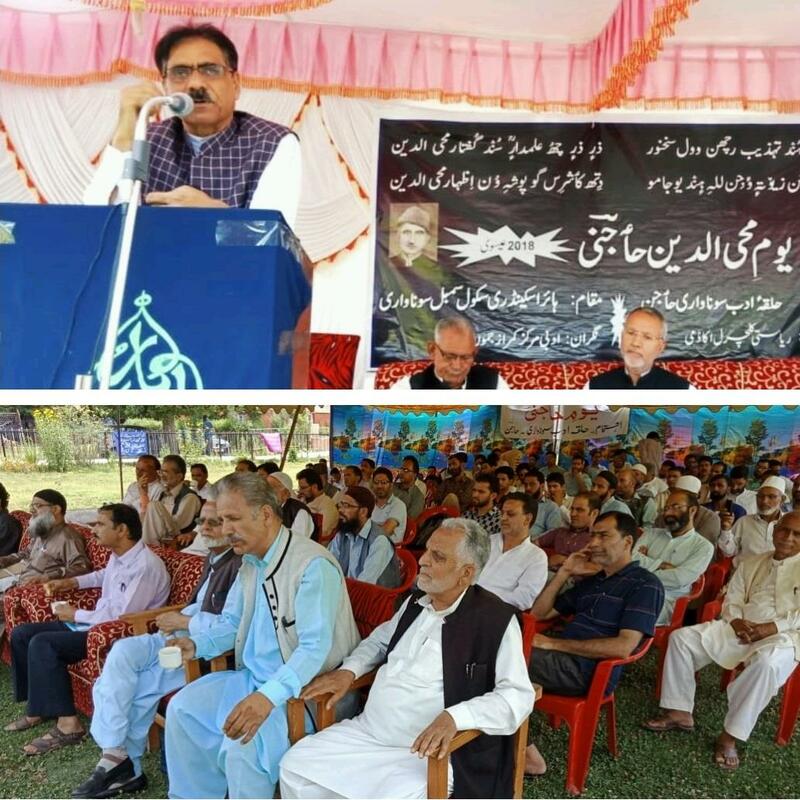 BANDIPORA: An impressive function was today held at Higher Secondary school Sumbal in memory of late Prof Mohi-u-din Hajini. A galaxy of literary personalities, poets, writers and intellectuals participated in the function. The function was organised by Halqa Adab Sonawari in collaboration with State Academy of Art, Culture and Languages. The function was presided over by Vice Chancellor Islamic University of Science and Technology, Prof Mushtaq Ahmad Siddiqi while as Secretary Cultural Academy Dr Aziz Hajni, president Adbi Markaz Kamraz Farooq Rafiabadi and president Halqa Adab Sonawari Abdul Ahad Hajni shared the presidium. In his presidential address, Professor Siddiqi threw light on the teachings and philosophy of Late Mohi-ud-din Hajini and said that he was a prolific writer of his age and worked for the upliftment of Kashmiri language and literature with a missionary zeal. Secretary Cultural Academy Dr Aziz Hajni presented the keynote address and gave a historical background of the Hajni Day. He said the best way to pay tributes to late Haji is to carry forward his mission of safeguarding Kashmiri language and literature. Others who spoke on the occasion include Farooq Rafiaabadi, Fayaz Tilgami, Mohammad Amin Bhat. On the occasion, this year's Khilati Hajini was awarded to Sonauallah Niyaz. Two Kashmiri books written by Majeed Majazi and Abdul Ahad Hajni were also released on the occasion.